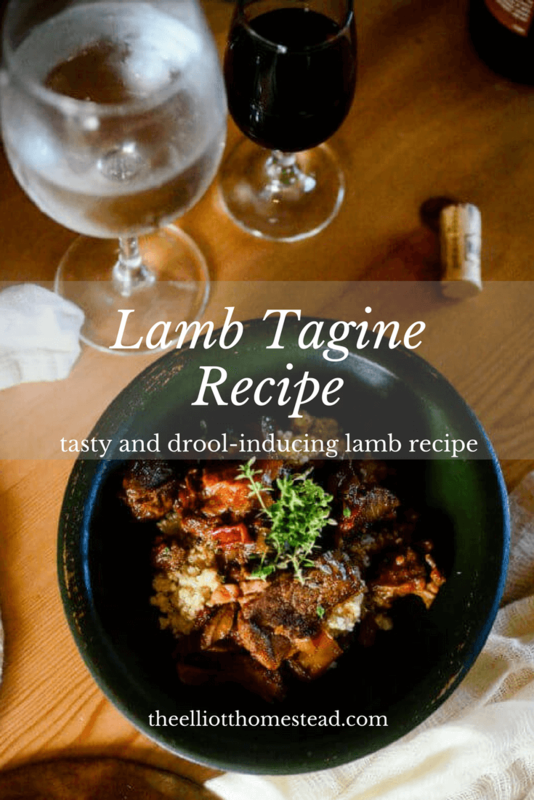 I hate how few lamb recipes I have on the blog thus far. Truth be told, our lamb is our favorite meat that we produce. We raised Katahdin lambs here on the farm, this year we have six to harvest, so our supply of lamb seems to always be plenty. The lamb always makes delicious meals, enriched by the meat’s moist and gentle flavor. Katahdin sheep are a hair sheep, meaning, they don’t grow fleeces. Thus, they don’t produce a lot of lanolin. Thus, the flavor of Katahdin meat is gentle and mild. 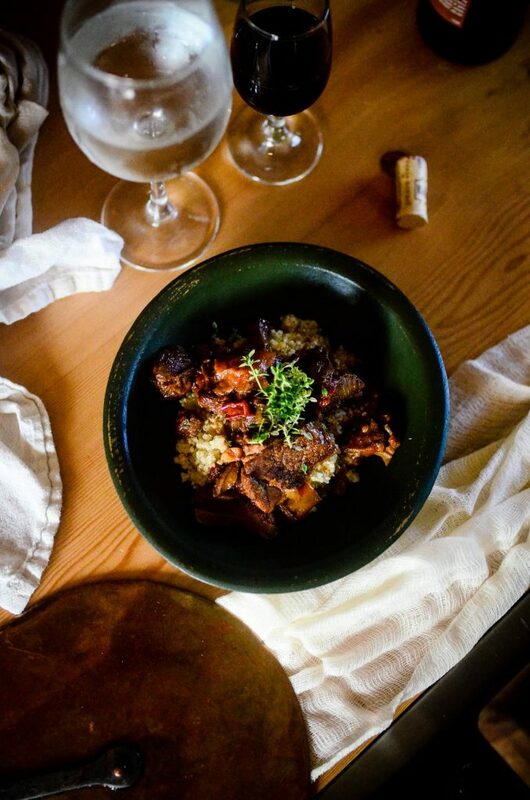 I’ve invited plenty of lamb-hates over for supper, only to convert them after only a few bites of this Lamb Tagine recipe. And honestly, if I would’ve tempted them in with this lamb tagine recipe, the smell alone probably would’ve been enough to do them in. Every time we make it, every family member dishes up second and third servings…. except for Juliette, of course. She just sits in her seat and moans until someone else finally breaks from their meal to help the poor thing out. Oh babies. Always making me take breaks from my food. The dish sounds fancy and has a hefty list of ingredients, but don’t be fooled. It’s no more complicated that an average beef stew. Combine the lamb, olive oil, salt, coriander, paprika, cinnamon, black pepper, and ginger together in a large bowl. Massage the lamb chunks into the spices until they’re spread evenly and coating all of the meat. Cover the bowl, stick it in the refrigerator, and let it marinade for at least 8 hours (up to 24 is even better). After the marinading period, remove the lamb from the refrigerator and preheat the oven to 325 degrees. Preheat a Dutch oven on the stove over medium-high heat. Add the lamb into the pan and sauté for 10-15 minutes until it’s gently browned on all sides. Can you smell that? CAN YOU SMELL IT?! Sorry. There I go shouting at you in food excitement again. Once the lamb has browned, add in the chopped onion and garlic. Saute until the onion is tender and translucent, about five minutes. Pour the wine and water into the Dutch oven and use a wooden spoon to scrape up all the browned bits off the bottom of the pan. Lastly, add in the diced tomatoes and maple syrup. Stir to combine. Put the lid on the Dutch oven and place it into the preheated oven for 2 hours. Remove the Dutch oven, take off the lid, and sprinkle the raisins over the lamb. Put the lid back on, the Dutch oven back into the oven, and let it finish up for another 20 minutes. Serve over buttered rice or quinoa and garnish with fresh herbs. See? Fairly simple. You can do it! And then you’ll realize that you love lamb. And then you’ll want to come to my farm and hug my sheep and tell them how much you appreciate the beautiful, tasty gift they bring to this world. And then I’ll call you my friend forever because you get me. This looks amazing! I have seven lambs fattening on pasture in my backyard, more lamb recipes please! Thank you thank you for this!! I’ve been waiting for you to share some lamb (and rabbit!) recipes here for a long time! We will definitely be trying this very soon. My favorite way to make lamb is ground lamb or stewing cubes cooked with red lentils, potatoes, carrots, onions, garlic, rosemary, thyme… and lots of butter. I so love how you write! I will put hugging your sheep on my bucket list! Yum! Please more lamb & rabbit recipes! Oh this looks beautiful and amazing! I can’t wait to give it a try! I made this recipe last night and it got rave reviews from everyone—it was delicious!! And so easy. We have two lambs in our freezer right now so this will definitely go on repeat. Oh how yummy! This makes me so excited to start raising Katahdin sheep next year (hopefully) and finally turn my husband into a lamb lover! Thank you! P.S. I would LOVE to come hug your sheep!! Hehe! This dish is AMAZING! All of my kids loved it. It was sooo good! We also love lamb and have raised Katahdin Dorper cross sheep for nearly 10 years. Love vone and rolled shoulder roast or leg marinated in olive oil garlic rosemary red wine Dijon mustard with salt and pepper. Then my hubby bbq’ s it to perfection! It is devine served with garlic mashed potatoes!